Why are these warehouses so important? There’s an odd relationship between Germany’s capital, Berlin, and the nearby city of Hamburg. They are close enough (about 90 minutes by train) that they feel connected yet so different. Berlin is cheaper and more bohemian – Hamburg is wealthier and, from an economical point of view, offers opportunities. Many Germans choose to live in Berlin because it’s cheaper but travel to Hamburg for work because it’s where the jobs are. 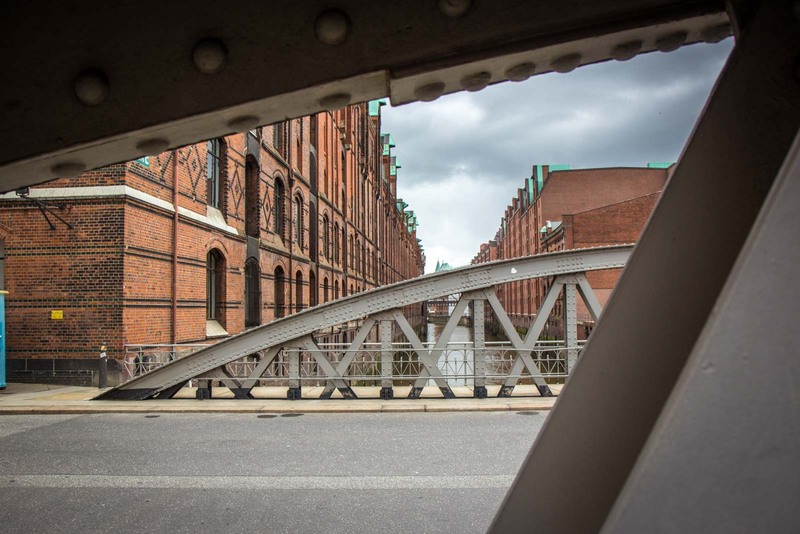 In Hamburg there’s a thriving scene of media, technology and artistic professions. It’s all very modern and cool. Yet, oddly, that’s not what the city is traditionally known for. It’s the port that really put Hamburg on the map. Ever since the 12th century, it’s been a trading city and the main port for central Europe. It really hit its prime in the 1800s. It was during this period that the Speicherstadt came into being. It’s this area near the port that I want to focus on today. As you may know, one of the things I write about is World Heritage Sites and the Speicherstadt was added in 2015. 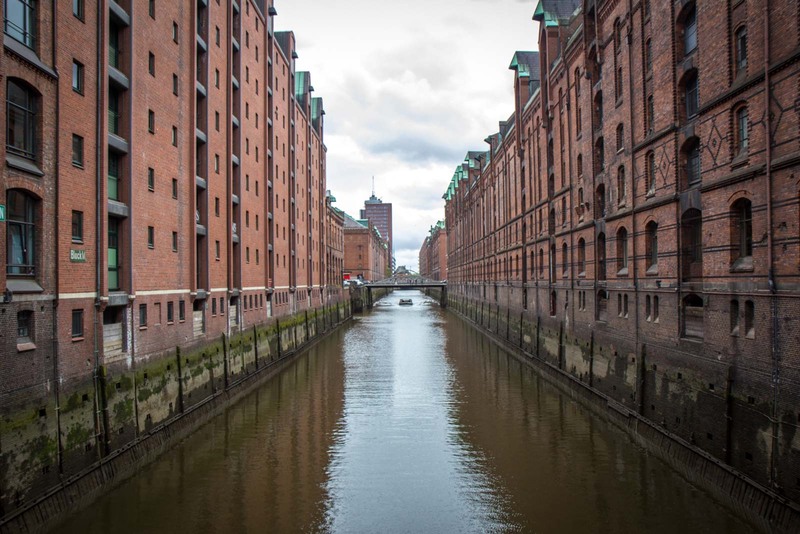 The Speicherstadt is a collection of brick warehouses adjacent to the main port area of the time. It’s not just any old bunch of buildings, though – it’s the largest warehouse complex in the world. Stretching for at least 1.5 kilometres, it is connected by canals which lap against the foundations of the large buildings on either side. There are 17 warehouses in total, each about seven or eight storeys high, built about a hundred years ago. Many of them were damaged during the Second World War but were restored in the original style. The Allies’ bombs could not destroy the heritage. What could have threatened the integrity of the Speicherstadt is the development in the area around it. Known as HafenCity, the massive area that fills more than 2 kilometres square surrounding the warehouses is being turned into a modern suburb of offices, hotels, shops and apartment blocks. 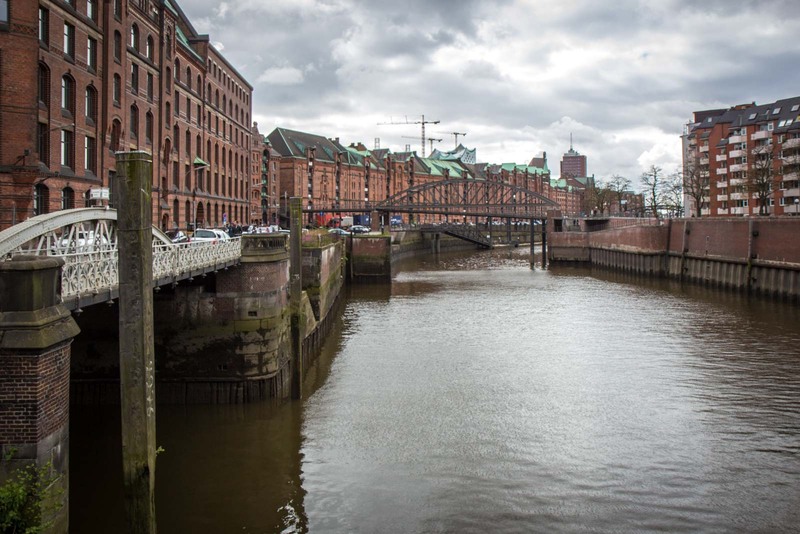 It’s the biggest rebuilding project in Europe but authorities decided many years ago to protect the historic Speicherstadt district within it. The warehouses were actually in use until just a few years ago. 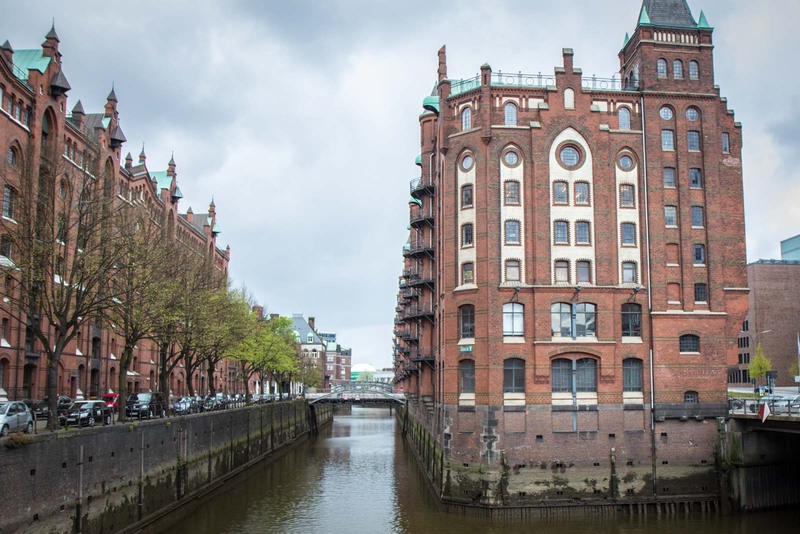 One statistic I read says that a decade ago the Speicherstadt was handling one third of the world’s carpet trade… as well as goods like cocoa, coffee, tea, spices and electronic goods. Storage has now moved further away from the city centre but Hamburg’s port is still an extremely busy one. For example, even though Russia and China share a land border, it is much cheaper to load electronics made in China onto ships, bring them underneath India, through the Suez Canal, around Spain and along to Hamburg and then take them by land into Russia and other Eastern European countries. Visiting Speicherstadt is very easy and it is, in fact, a very popular area for tourists. Some of the buildings have been turned into museums – like the appropriate German Customs Museum and Afghan Museum – and the Hamburg Dungeon and Miniatur Wunderland model railway. But the real highlight here is the buildings themselves. Together they form an impressive block of history. Take the time to look carefully, though, and you’ll see some artistic flairs on the otherwise practical facades. The turrets, the windows and eaves all have decorative elements that aren’t immediately obvious but appear upon further study. As I mentioned, the Speicherstadt was included on UNESCO’s World Heritage List in 2015. It certainly fits all the criteria and represents not just an impressive architectural style, but the rapid growth of international trade in the 19th and 20th centuries..
Time Travel Turtle was a guest of the German National Tourism Board but the opinions, ovewritten descriptions and bad jokes are his own. Interesting post. It reminds me of the canals that you can find in Manchester and Leeds in the UK. I’ve always wanted to live in a warehouse-style apartment – the architecture really appeals to me. Well, a lot of the people who work in Hamburg choose to live in Berlin as well (partly because it’s cheaper). But Hamburg is a reptty cool place. I didn’t see too many apartments in these buildings – they seem to be mainly used for commercial purposes- but I think there’s a bit of residential. That would be super cool to live in! It’s also quite interesting to follow the change by the quickly developing adjacent Hafen-City. Thanks! 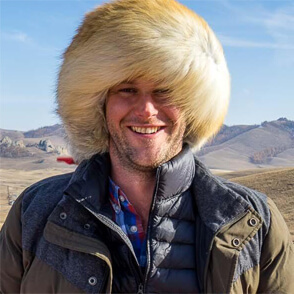 Awesome panorama shot! I really love your stuff and how you put it all together. And Speicherstadt is really a perfect place for that kind of photography. You’ll have to go back and do one of HafenCity when all the development is finished there! 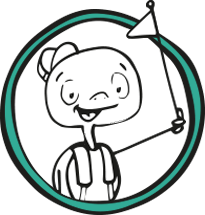 Thanks for this interesting post about the site! The question in your topic is exactly what I was wondering when I read the list of new Unesco world heritage sites announced last month. 😉 Hope you don’t mind me linking here in my latest post about the new sites.